Health insurance coverage helps people gain entry into the health care system, obtain the care they need, and establish an ongoing source of care. People without health insurance are more likely to lack a usual primary care provider, receive less timely care, and have fewer health services overall. Among adults age 25 to 64, those with less than a high school education were almost 9 times as likely to be without health insurance as those with an advanced degree. 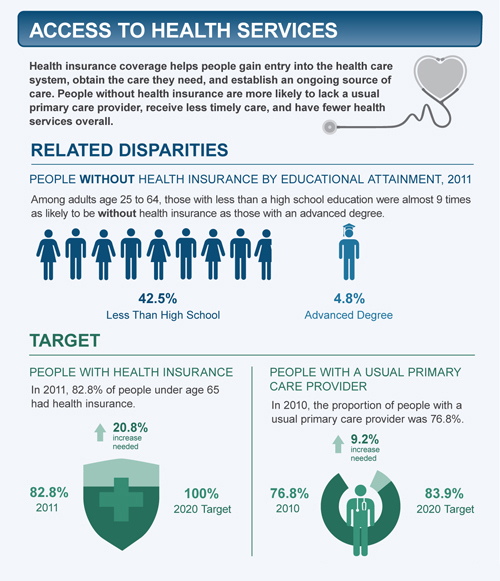 In 2011, 82.8% of people under age 65 had health insurance. In 2010, the proportion of people with a usual primary care provider was 76.8%.